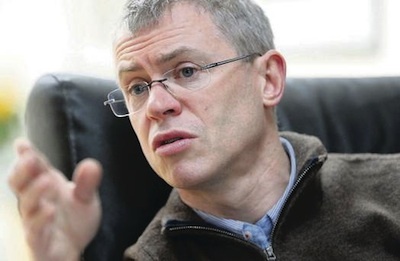 Brian Feeney looks at the controversy over comments by sports commentator Joe Brolly in defence of nationalist communities who name facilities after hunger strikers and other republican heroes. For the Irish News. Joe Brolly’s brusque dismissal of complaints that the GAA names clubs and grounds and trophies after dead republicans provoked outrage from the usual suspects. It’s worth probing the matter a bit further. Some people now think Brolly’s remarks were a response to Peter Robinson’s speech at the Cooperation Ireland dinner at Queen’s. Not so. In fact during his speech Robinson made no reference to the naming of GAA grounds or clubs or trophies. The remarks about these were made by Gregory Campbell on BBC the next morning as he hemmed and hawed to avoid answering the question whether he would attend a GAA match or similar function. Brolly’s retort was in exasperation at Campbell’s ebgrudgery. After all, if the queen can go to Croke Park who is Campbell to demur? Or maybe he’s more British than the queen? If anything that was a dig at Sinn Fein for their commemorations of dead volunteers. What should have been put to Campbell was, as a member of the apprentice Boys of Derry, what does he think of the Cullybackey branch of the apprentice Boys unfurling a banner presented to them by ex-RUC man and convicted multiple killer William McCaughey around the time of the death of Kevin Lynch which so exercises Campbell’s emotions? Is he happy to be a member of such an organisation? Does he think it’s all right for the orange order and apprentice Boys to extol dead (and in some cases live) members of the UVF? It’s a hoary old chestnut calling the other side’s dead ‘terrorists’. It’s unhistorical too for Robinson or any one else to talk about ‘terrorism in the past’. After 2000 the Americans and their British poodles redefined terrorism so broadly that George Washington would have been classed as a terrorist. There are scores of heads of state in Africa and the Far east who did jail time for terrorism in former British and French colonies they were trying to liberate. After all, Lady hacksaw regarded Nelson Mandela as a terrorist though he obviously represented the majority of people in his country. Here, dismissing republican dead from the past (where do you start?) as terrorists while happily marching behind bands extolling loyalist killers has deeper causes than mere hypocrisy. It continues the unionist tradition of the ethos of superiority and cultural dominance. Listen to Campbell’s patronising language about the GAA ‘making progress’. To where? To a level where they’re like the apprentice Boys of Derry perhaps? To a stage where the likes of Campbell will approve? Would that be to the point where they have no separate identity? It seems that would be the ideal unionist position. That position would not apply only to the GAA but to any organisation or manifestation of Irishness. The unionist loathing and contempt for the GAA and the Irish language masks fear and insecurity and harks back to the attempts to rob Irish people of the possibility of any autonomous development, to refuse any cultural concessions. Attempting to interfere in the naming of clubs, grounds or whatever of an autonomous cultural and sporting organisation like the GAA is a classic example of the ethos of superiority that has bedevilled this place for ages. It merely serves to infuriate members of such organisations and makes them determined to continue to demonstrate their autonomy. Being able to name a place or having control over the name demonstrates ownership. For example orange bands call themselves after places where no orangemen live, like Ardoyne, or Whiterock, to try to show that northern nationalists own nowhere. So Joe Brolly’s retort to Campbell was a knee-jerk assertion of autonomy and a reminder (which will pass over Campbell’s head) that there’s more than one way to skin a cat.